I am so lucky that I get to hang out with Lori Nova, two days in a row. She won the best swirl for the Soap Guild show for the last two years. Here is her non-entry entry for this year. The Guild wanted to give someone else a chance to win so Lori didn’t get to officially enter. 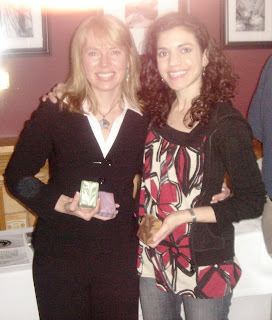 Still, she’s teaching here and I’m sure her soaps and her class will be an inspiration for everyone. I’m headed off to give my last speech of the conference on growing a business. I received soaps from Lori, and they are beautiful. 4 nice swirled artworks for me to test, enjoy and review. lucky me!!! And lucky you for being there. I wish I could have been there, if nothing else to meet you, Lori, Heather from Twin Birch and all the other wonderous soap people. That’s amazing. She does a great job. How do the rest of the soaps look that were entered? I sure wish I could be there this year.